Tribes Overall: "Amazing holiday with so many memories"
Tribes Service: "Excellent thank you. " Guides: "Varied over the holiday." Social & Environmental Responsibility: "Guides mentioned money going back to local communities." Great intro to the area. Great view over the plains.. Evidently a lower standard than the others we stayed at, but expected this. Rooms were very good, comfortable and clean. Loved the inside and outside shower. Good mix of guests. Food was very good. Birthday celebrations lovely. Safari excursions good. Guide Innocent was very good, nice guy and very friendly. Amazing rooms, large modern and very clean. Lodge staff very friendly, helpful and accommodating. Food great quality. Taxi /driver on hand to call for pick up and drop off was very helpful to get around Victoria. 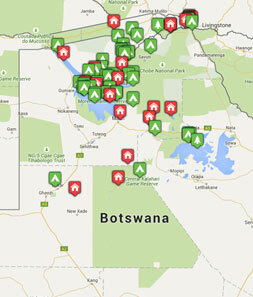 "The variety of safariâ€™s over the three different locations was fantastic. Local guides commended Tribes on a well constructed itinerary. Great birthday celebration with cake, dancing and local singing at Chobe Elephant Camp. The heronry at kanana was a totally unexpected experience, astonishing as well as the amazing amount of bird life, we have returned home as â€˜twitchersâ€™. The location of Machaba lodge by the river, fantastic watching the elephants and hippos from our tent! Khwai was particularly rewarding in terms of game viewing due to the transit of game from one reservation to the other. We will never forget our hour spent watching the leopard drinking by the river and strolling back to the bush to eat his breakfast! Neither will we forget the amazing sight of various prides coming together to enjoy the meal of a giraffe over thee days. Two males, five females and all the cubs eating, sleeping and playing together. Truly special."